The Sugar Bistro restaurant at the ODEL Promenade is constantly packed whether it’s for brunch, lunch or dinner. Their main restaurant has been operating for years at the Crescat Boulevard and with the recent launch of the ODEL Promenade, Sugar Bistro opened its second restaurant in Colombo at this popular location. We popped by to take a look at this new restaurant and their new menu. Here’s what we thought! 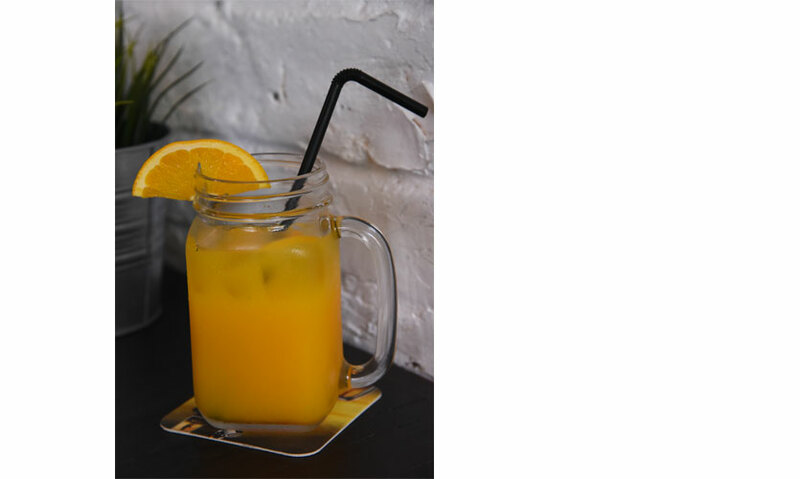 The Drinks Menu at Sugar Bistro ranges from fresh juice, milkshakes, iced coffee, fizzy drinks, coffee, tea and fresh juice blends so you are spoilt for choice. As their in-house specialty is their fresh juice blends, we opted to give that a go. We ordered their Mango, Coconut and Pineapple juice blend at Rs. 650 and weren’t disappointed. 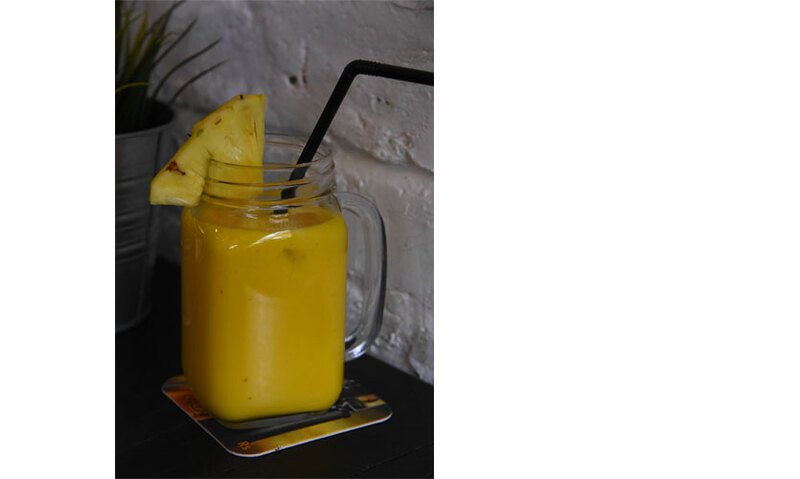 A thick blend of mango and pineapple mixed with coconut milk, the drink had a perfect balance of flavours with the coconut blending seamlessly with the sweetness of the fruits. If you are looking for something healthier and a little less fruity, their Gotukola and Green Apple blend (Rs.500) and their Beetroot, Carrot, Celery and Ginger blend (Rs. 650) come highly recommended. The Sugar Bistro menu at ODEL Promenade is a revamped menu combining the menus at their Crescat Boulevard restaurant and 41 Sugar so it is quite extensive with a variety of dishes to select from. We started our meal with their latest introduction to the menu; salads. 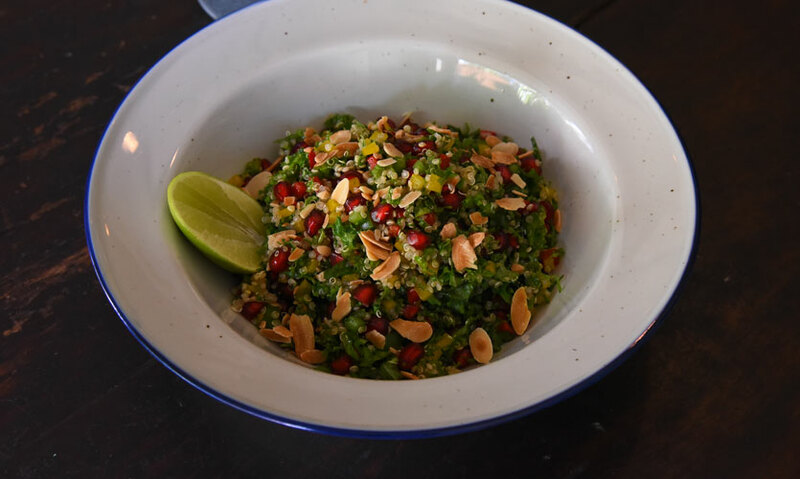 Their Kale, Quinoa and Pomegranate Salad in Lemon Maple Dressing (Rs.1250) is as good as it sounds. A burst of colours on your bowl, this 3 ingredient salad is super fresh and refreshing. A perfect meal if you are eating healthy! We also tried their Roasted Pumpkin and Feta Cheese Salad (Rs. 1200). Roasted pumpkin slices, cherry tomatoes and salad leaves tossed in an olive oil dressing created the dish. While we felt that the roasted pumpkin lost a bit of the crunch due to the oil dressing, the generous portion of cheesy croquettes on top certainly made up for the crispy factor. 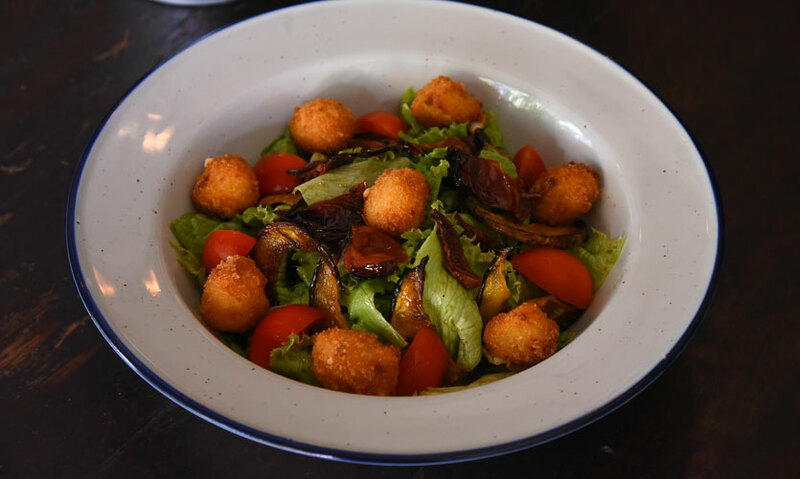 Other salad options include the Chicken Caeser Salad, Middle Eastern Roast Vegetable, Feta and Couscous Salad and the Black Pepper Crab Salad. For appetisers we tried their Hot Butter Cuttlefish (Rs.850). Thin cuttlefish rings in a crispy batter were served with a sweet chili sauce dressing. Although I’m a fan of a spicy HBC, the sweet chili sauce was the perfect balance of sweet and spice and the calamari was cooked to the right texture. Selecting mains was our most difficult choice. The menu has over 10 mains that all sound utterly divine so figuring out what you are in the mood for is the tough part! For the vegetarians, the only option available is their Paneer Biryani (Rs. 1300). 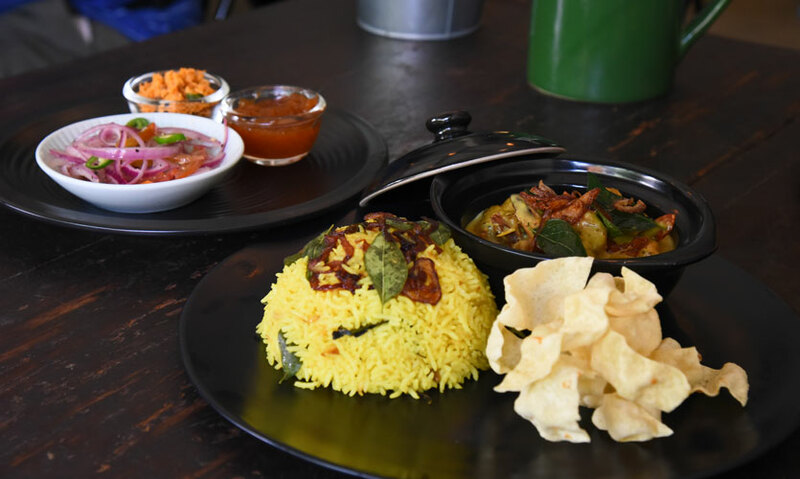 Served in a big steel thaliya, the paneer biryani is accompanied by a pineapple and mango chutney, cucumber raita and papadam. 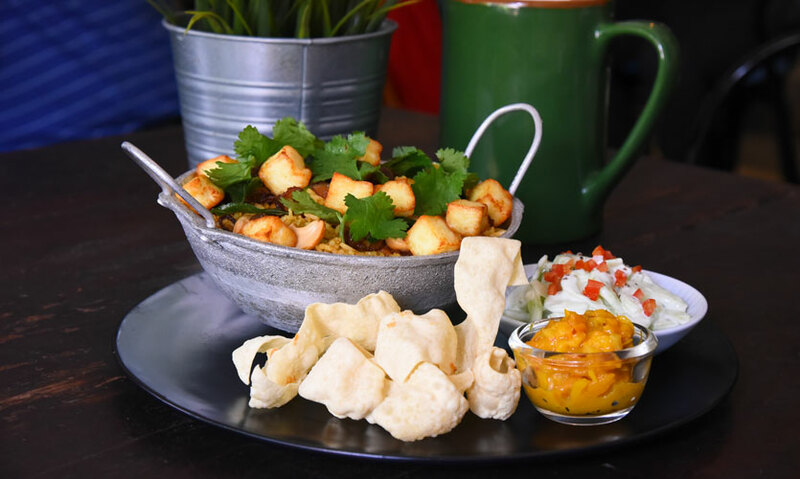 The paneer biryani was full of flavour and the portion is easily shared by two persons. We then tried their Batticaloa Prawn Curry (Rs. 1350) which is served with saffron rice, onion sambol and papadam. The Batticaloa prawn curry had at the heart of Colombo can take you to the East coast of Sri Lanka in a second. Beautifully spiced, this thick curry is perfectly paired with the flavourful saffron rice. The dish is a signature dish at Sugar Bistro and it’s easy to see why. The Crab Kottu (Rs. 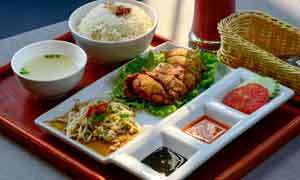 1250) is the star dish of the restaurant. Being the only dish I consistently order every time I dine in at the restaurant (I’ve tried to be adventurous but my mind, heart and stomach is loyal to this dish!) the Crab Kottu is easily a crowd favourite. Served with a fried egg, onion sambol and their own in-house secret sauce, the Crab Kottu doesn’t skimp out on the crab meat. The portion is massive! We also had their Jerk Chicken (Rs. 1450). This oven roasted chicken is marinated with jerk spice and red wine jus and roasted until crisp on the outside and tender inside. 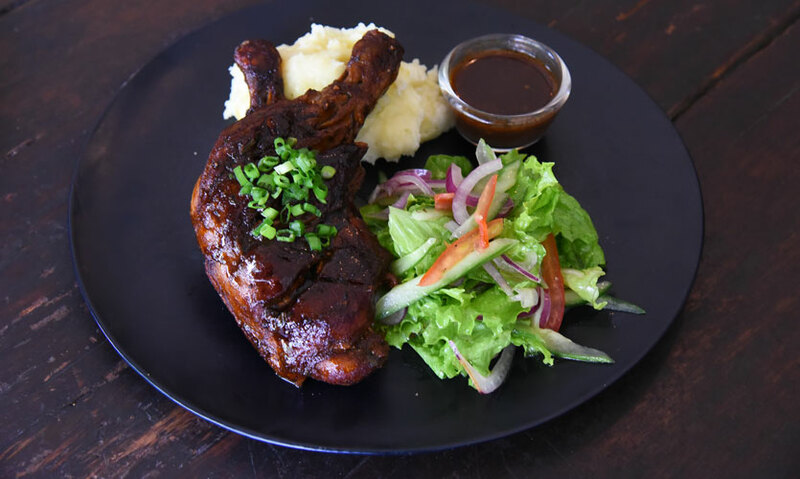 Served with creamy mashed potatoes and green salad the chicken was succulent and is a dish that will easily satisfy any meat lover. 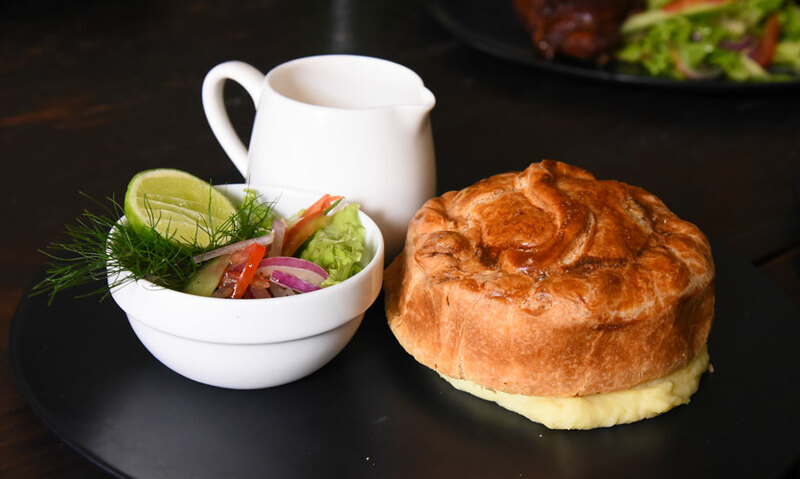 Sugar Bistro in revamping their menu has also introduced a range of homemade pies with fillings such as butter chicken, black pork and onion, beef and mushroom and vegetable. We tried their Creamy Seafood Pie (Rs. 1100). Fresh from the oven and on a bed of roasted garlic mashed potato; the seafood pie was definitely creamy. The pastry was soft and flaky and the filling included fish, cuttlefish and prawns to name a few. 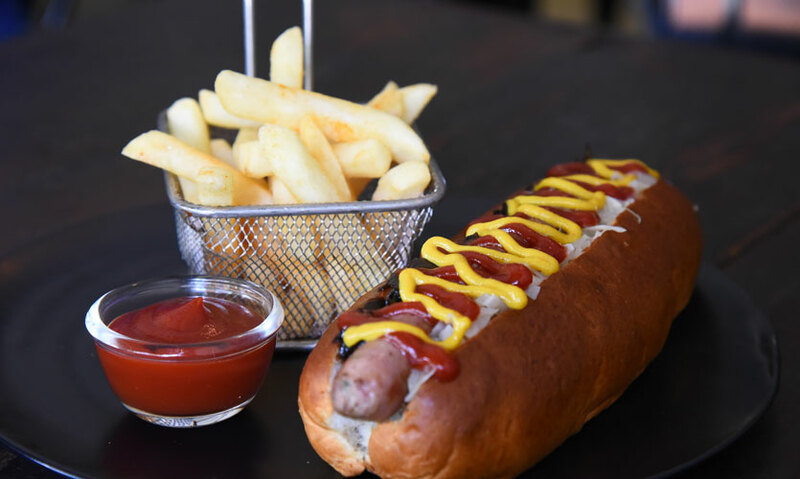 While the Sugar Signature gourmet burgers are widely popular, a recent addition was made to include their own hot dogs. For now there are two gourmet hotdogs; the Ollie (Rs. 1050) and the Jabba (Rs. 1050). We opted to try both. Made with German artisanal sausage and homemade bun, the Ollie and Jabba are contrastingly very different. 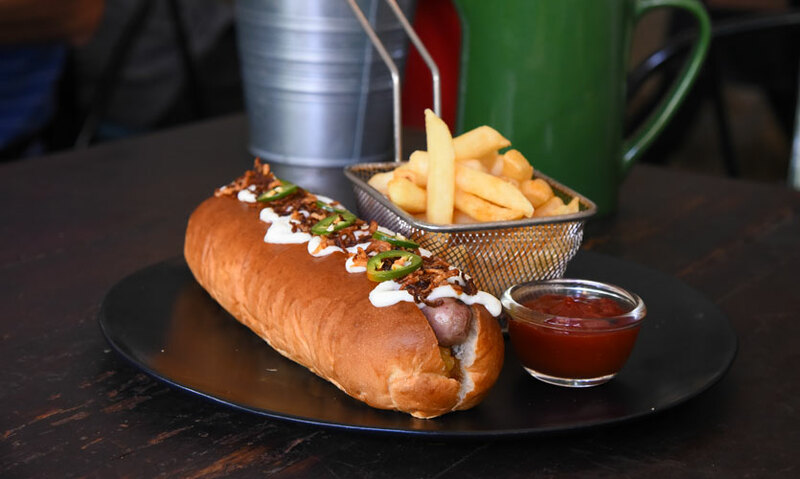 The Ollie is simple with just caramelised onions, ketchup and mustard while the Jabba is packed with condiments like caramelised pineapple, BBQ sauce, garlic mayonnaise, friend onions and jalapeno pepper on top. A contrast of the classic and the modern, we loved both hot dogs but thought the Jabba was something different with its unique ingredients! Our favourite part of any meal however, is dessert. Their signature Churros (Rs. 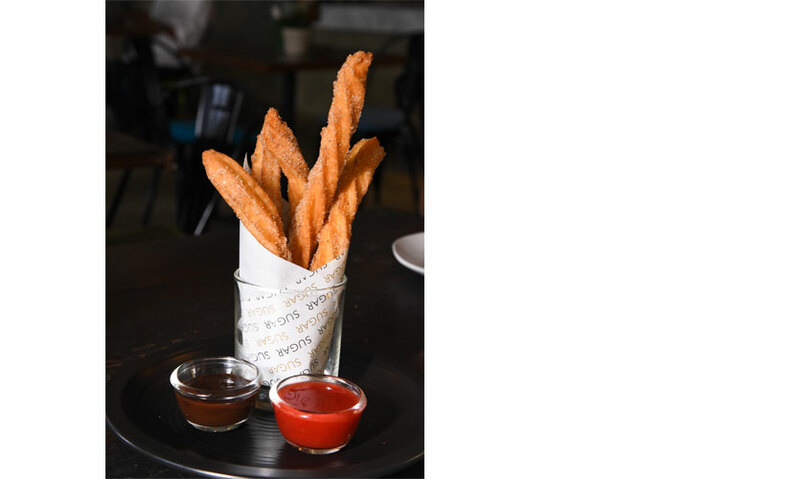 550) are perhaps the best churros you could find in Colombo. This homemade churro is utterly soft with a light hint of cinnamon for flavour. Served hot of the frying pan, the churros are accompanied by a chocolate sauce and a strawberry coulis. 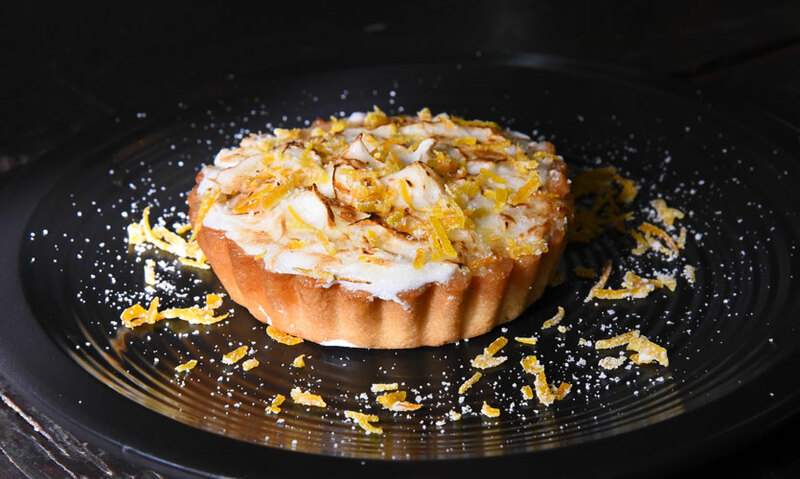 Their Lemon and Orange Meringue Pie (Rs. 650) is visually stunning, and also excellent in terms of taste. A beautiful marriage of flavours, the pie was both sweet and citrusy. The staff at Sugar Bistro is very attentive. 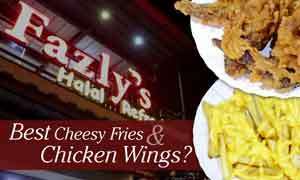 They are friendly and helpful and well versed with the menu to recommend a few dishes depending on your mood. regular spot for most people!